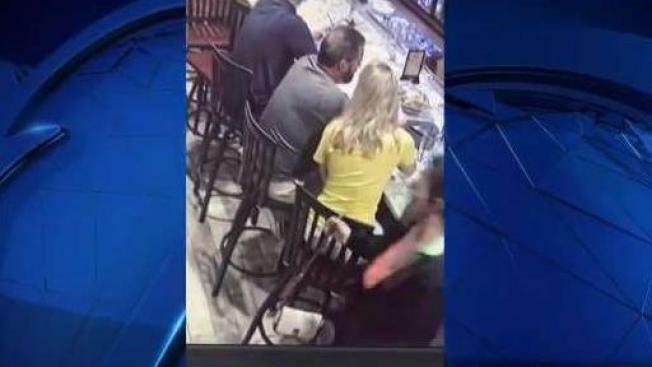 Police say a surveillance video shared on social media helped them identify a woman who allegedly stole a purse at a restaurant in Londonderry, New Hampshire. A purse was snatched in Londonderry, New Hampshire, and police are saying social media solved the crime. The incident was captured on surveillance cameras inside La Carreta Mexican Restaurant Tuesday night. "I had no idea she was even standing behind me," the victim, who did not want to be identified, recalled in an interview with NBC Boston on Thursday. The woman says she can't believe what happened right behind her back while she was enjoying dinner with her husband. "I stood up and my pocket book was gone," she said. The surveillance video shows the victim sitting at the bar when another woman swoops in, snags her purse, and hurries out the door. "It's just an awful feeling to see someone so close in your space," the victim said. La Carreta and the Londonderry Police Department both posted the video to their Facebook pages, and within one hour, police had received dozens of tips. "We got so many shares that we probably had about 40 people call and identify the same woman," explained Detective Chris Olson. The suspect was identified and police are now drafting warrants for her arrest. "Social media can be used for a lot of good and as a police officer, I know I use it all the time to ID suspects and get info out there," Olson said. "It's a great tool if used properly." The victim's purse was found empty in a nearby parking lot. "My license, my credit cards, my everything," the victim said she lost. But she says the support on social media has made a bad situation a whole lot better. "The community came together, it's wonderful," she said. "People want to help people." Police say the suspect will face several charges in different towns because she used the victim's credit cards at stores all over the area. They hope to make an arrest by the end of the week.